The reps assembled at the Gregory Alonzo Showroom at the Ohio Design Center to show the new fabric introductions and I had a distinct feeling that I've been there before. Velvets were plentiful in all colors. The only thing different was rather than being cotton velvet, the fabrics were a blend of natural and man-made fibers -- mostly polyester and cotton. The reasoning behind the blend of fibers is that the fabric has a better performance. I must admit that I'm a bit of a snob and prefer natural fibers. I'm not saying that these velvet blends were inexpensive at all. They came in at medium to high price points. 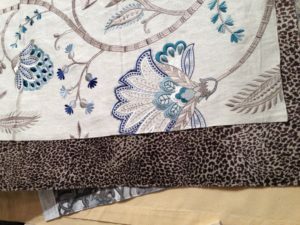 Other fabrics that were plentiful were linens, again blends of natural and man-made fibers in most instances, embroidered fabrics with several Tree of Life patterns, toiles, subtle plaids and animal prints. Ombré, color gradation across the width of the fabric, was well represented including pattern on top of ombré. Graphic prints were plentiful with a few Mid-Century, Arts and Crafts and Art Deco prints represented.